You must be a member of the Munich Watersports Group to attend this activity. Would you like to join this group? Defi Wind is a unique event. 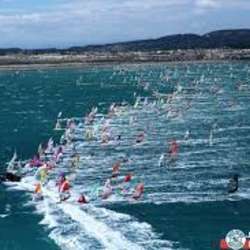 About 1,400 participants (amateurs and pros) participate in the same windsurf race. It is a "must" for all real windsurfers to participate at least once in their live at this event. Inscription starts at February 15th. As usual the list of participants will be full after only a few days. So hurry up!